It's not uncommon for BLU to discount its phones for a day or two right after their releases, and the new R1 Plus's launch is proving to be no different. 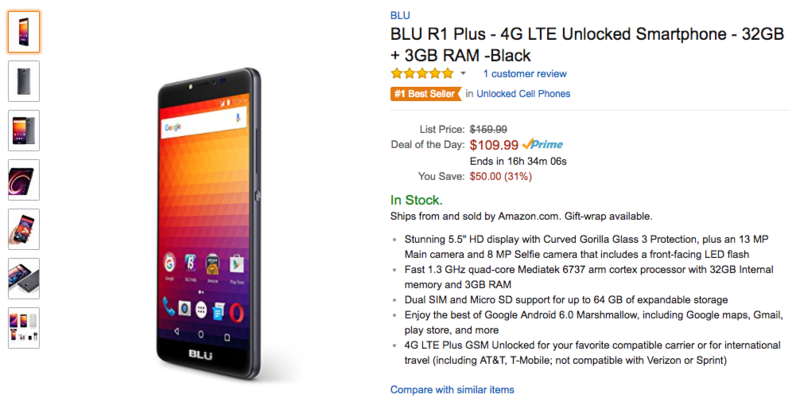 Following its unveiling yesterday, the Plus is now available from Amazon at a pretty substantial $50 discount. If you're in the market for a long-lasting phablet and don't need the latest specs and software, this may be worth taking a look at. The R1 Plus sports a 5.5" 720p display with curved edges, a 1.3GHz MediaTek MT6737 quad-core chip, 3GB of RAM, 32GB of storage and a microSD slot, a 13MP rear-facing camera, a 5MP front-facer with flash, and a massive 4000mAh battery. It's GSM unlocked and supports LTE (including T-Mobile's Band 12 and AT&T's Band 17). Those specs were already pretty decent for $160, but $50 lopped off of that makes it even more enticing. Unfortunately, it is running Android 6.0 Marshmallow, but as many of you have pointed out, the target market for this device probably won't care. Interested in picking one of these up? Well, you've got until the end of the day to do so at the discounted $109.99 price. After that, it'll go back up to MSRP. This being Amazon, you can also get free two-day shipping if you're a Prime member. Check the source link below to see the listing.